Kitten Coffee, a roaster located in Bed-Stuy is opening what looks like its first retail outlet at the former Blackbird spot at North 6th and Bedford. Evolve Motorcycles, a manufacturer of electric motorcycles, is opening a showroom (its first?) at 155 Grand Street (the former location of East Street Gallery and before that Lawanna’s last outpost). The storefront next door is available – the pizza parlor that had been there was seized by the marshals last month. 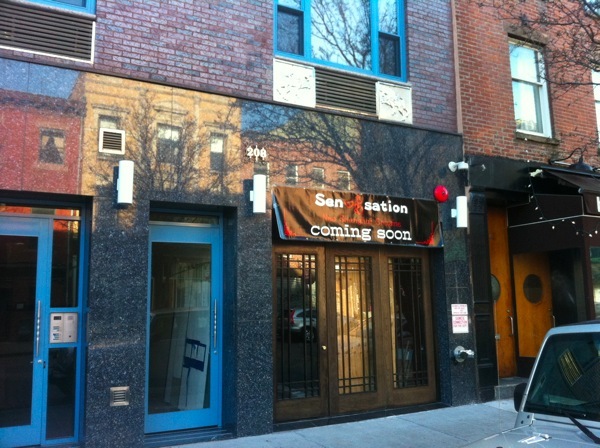 208 Grand Street (at right, the new building with the best air conditioner grilles in Brooklyn) is getting a restaurant – Sensation – which will serve “new Shanghai cuisine”. The newly-opened Hotel Williamsburg is changing hands – the potential new owners came to CB1 tonight for a transfer of the liquor license. One of the new owners was involved in the operation of the Barbizon, Ryalton, Paramount and Gramercy Park Hotels, as well as Coco Pazzo on the Upper East Side. The second partner is Meyer Chetrit (coincidentally, the Chetrit Group has just sold 175 Kent to Sam Zell). Also on the CB1 docket tonight (but not on the Northside), the owners of Traif are opening Xixa, Mexican restaurant, three doors down at the old Aldo’s Coffee Shop space on South 4th Street.